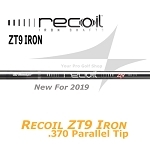 THE RECOIL ZT9 IRON SHAFTS ARE DESIGNED TO PROVIDE MAXIMUM CONTROL AND DISTANCE FOR ALL GOLFERS THROUGH THE LATEST IN DESIGN AND MATERIALS. 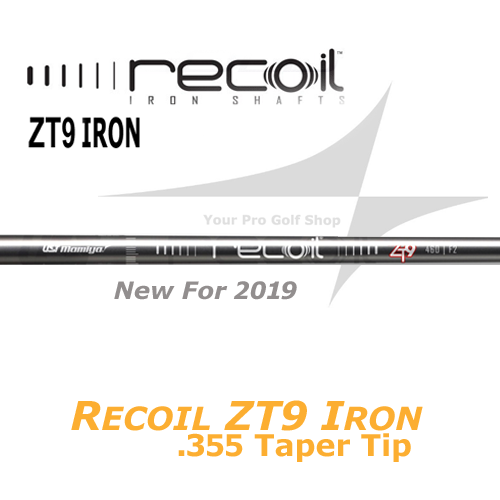 ZT9 IS THE FIRST EVER MATERIAL TO BE UTILIZED IN A GOLF SHAFT. Higher damping provides better elongation of material to increase damping rate for better feel on mishits. The raw shaft is put into a vacuum chamber where metal ions are emitted and bond to the shaft. The process takes extra time and is more expensive than traditional methods. This extra step is all done in-house, so we are able to ensure tighter control for the best quality. Recoil- It's more than a reaction. It's a revolution. *Taper tip available upon request.